I attended my second Pressnomics a few days ago. It was overall fifth Pressnomics till date. Coincidentally, this was my fifth US trip too! ? Before I write more about the “meta” part, I will write about my Pressnomics experience first. With so many amazing people around, Pressnomics offers a lot to learn! There are tons of memories to preserve. This time only good ones! ? Below are some of the memorable interactions. Pippin Williamson shared his reasons to close public forum for his EasyDigitalDownloads product and move all support to the private 1-on-1 helpdesk. Pippin also shared how his decision worked for them, and how they handled the transition. At rtCamp, we are also planning to close public support forum for some of our products. So thanks Pippin for awesome guidance. ? Daniel Bachhuber answered my questions about few design decisions they made on WP-CLI project. As we are moving EasyEngine to PHP, his knowledge means a lot to me. I am hoping to catch him again at VIP Workshop for the sequel. ? With Joe Guilmette, we discussed one of the most dreaded topics – “when to use or not use WordPress for a project?”! Of course, there are many more things we keep discussing all year around as I meet him more often than I meet my local friends! ? As rtCamp is growing fast, I am facing new challenges on the management side. I used this opportunity to talk about my pain points to John Eckman and Karim Marucchi. It was a privilege to learn directly from CEOs of top agencies! They were very helpful. ? From Joshua Strebel, it was great to hear why & how he focuses on the enterprise business. At rtCamp, we shifted our focus to the enterprise segment a few years ago. So it’s good to see how other people doing it and learn from it! ? On another hand, it was interesting to see Syed Balki focus on small & medium businesses. Another aspect I liked about Syed is the way he handles partnerships and builds an ecosystem. ? I can’t thank enough to Chris Lema. Chris answered many questions on different topics. My second favorite part was his way of building a high-performance team that I would like to work on immediately. The first favorite part was of course cigars! ? Then as always, I learned a lot from my friends Karthik Magapu and Nirav Mehta. A reason, I always reach out to peers to travel/stay together is to maximize interaction points. Once we are back to work, we rarely get time to call each other. So traveling together certainly helps! ? In Tempe Hotel from 12:30 pm on April 5 to 4:30 am on April 9. 88 hours stay ? This includes 5 hours delay caused by missed connection on way back. Thing got worse for me as I did not sleep the night before I left the US, and by the time I reach home in India, it was morning time. I went to the office without any sleep. I literally crashed in the second half of the day. ? I traveled by Cathay Pacific second time in my life and both time they missed my connection at HongKong. 100% failure rate for tight connections! If Cathay is not efficient, they should stop selling such long journey tickets with tight connections. Nonetheless, this is nothing compared to the recent United Airlines incident! ? I am still grateful to Cathay for limiting delay to 5 hours. Last time, in 2014, I was stranded for 18 hours. I know some people who make quick long-distance trips frequently. But they don’t have health issues like me. I missed Pressnomics’ second half on day-2 and also the second half on the activity day. Others’ success rarely made me envious but I am feeling jealous these days when I come across healthy people. Maybe that’s why they say, health is (real) wealth! ? =? Apart from shortest, this might be my biggest group trip to the USA. We were a group of six people from India. 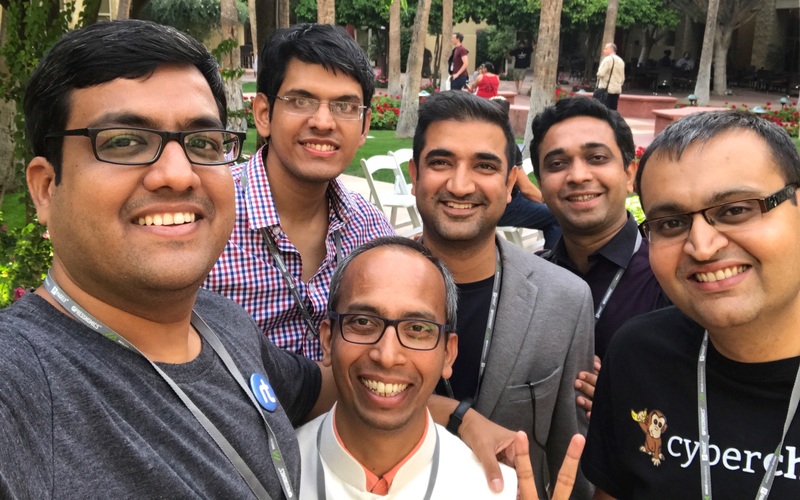 3 of them – Karthik, Vishal, and Karan – were attending Pressnomics first time. I persuaded Karthik and Vishal to attend. I hope they found Pressnomics worth and will attend again! ? I hope we will have an even bigger group next year. Let me know if you would like to join us next year! ? This is the first time I stayed in the conference hotel. It worked very well. I could go up and take rest whenever I was feeling unwell. Come back down again whenever I was feeling better. Of course, this is not the only reason. Toughest part when traveling in the group is to move people from point A to B.
Nirav and I went to Bank of America to understand account opening process. The process turned out to be much easier than I thought. The bank staff told us that it was even easier in old days! Because of health issues, I avoided alcohol for the most part. I did not touch alcohol at PostStatus after party and also at Pressnomics after party. It worked well for me. Maybe I should go alcohol-free for some time! I had an amazing time, despite my health issues, and learned a lot from a lot of many people. I wish I could write about every interaction and every person I met but that will be too much to write. This itself took more than one-week! So thank you all amazing people out there for helping me. Especially, thanks, Joshua, Sally and entire Pagely team for organizing Pressnomics. ? Rahul – Thanks a lot to you & Nirav for persuading me. 🙂 The event was nothing less then a treat. And I am so looking forward to PressNomics 6. Thanks for sharing the experience Rahul. It’s inspiring indeed. Hope to join with you to the next Pressnomics. ? And yes, health is the real wealth. Please invest some time for yourself to keep yourself fit. Take care ??? and all the very best ? Hope to see you at Pressnomics. Thanks. ?